Reviewing corporate policies companies use to manage chemicals, including goals for reducing chemicals of high concern, and whether progress has been made towards meeting these established goals. Read more. 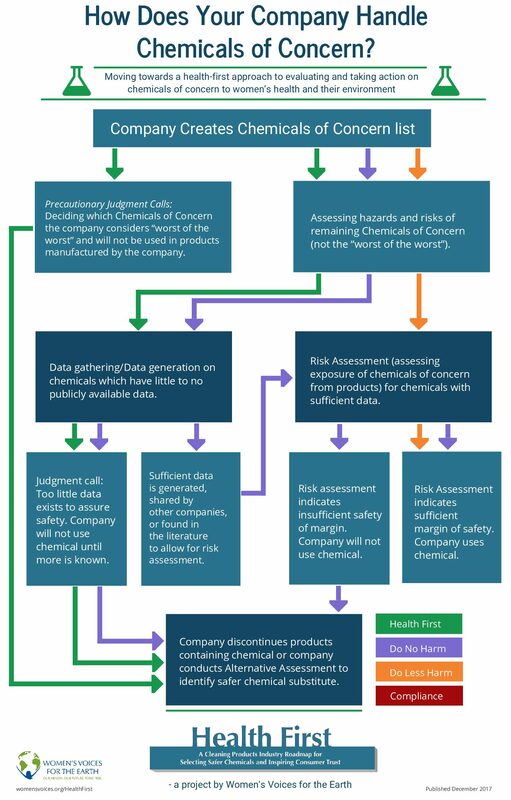 Evaluating whether companies publicly share information about their safer chemicals policies, practices, and criteria. Read more. Appendix 1: Women’s Voices for the Earth (WVE) Indicator Chemicals List. View now. Examining specific approaches, methods and criteria for evaluating chemicals, determining chemicals of high concern to reduce or eliminate, and assessing alternatives to avoid regrettable substitution. Read more. Highlighting the importance of collaboration among companies that manufacture cleaning products. Read more. Appendix 2: Companies & industries with components of strong chemical screening programs. View now.